EAs and members of Combatants for Peace walking together at the demonstration. Photo EAPPI/L. Hilton. The Bethlehem Governorate is one of 16 administrative governorates in the West Bank. It covers an area of 658km2 with approximately 210,484 people as of 2014. With the 1995 Oslo II Accord agreement, the West Bank was split into 3 non-contiguous areas with Area A (theoretically) in full Palestinian control and comprising 3% of the West Bank, Area B under Palestinian civil control but Israeli military control, 23-25% of the West Bank, and Area C completely under Israeli control, currently over 60% of the West Bank territory. This fragmentation, with some referring to the West Bank as “Swiss Cheese land”, was meant to be for an interim period of 5 years, until 1999, but the Bethlehem Governorate, as with all of the West Bank, is still divided, although with slightly different percentages, into these administrative “islands” of Areas A, B and C classification. In addition, 10km2 of the Bethlehem Governorate have been illegally annexed by Israel as being within its “Greater Jerusalem” designation. This intricately complicated division, usually left not signposted, leaves only 13% of the 658km2 of the Bethlehem Governorate under full or partial Palestinian Authority control. What do these numbers mean in reality? Take Khallet Annahlah, a small rural village with rich fertile land close to Bethlehem. On the 16th April, one of our first duties within the Bethlehem team was to attend an incident there. We met with a local Palestinian nonviolent activist named Hassan, from the nearby village of Al-Masara, as well as members of Combatants for Peace (CfP), an Israeli and Palestinian organisation set up in 2005 from former combatants of both sides who have decided to relinquish their weapons and work together in nonviolent approaches towards ending the occupation and a just peace for both sides. With Hassan & CfP, we walked on the farm of Mohammed Khalil where a new Israeli settler tent had appeared, in the land that he was born on and now fears will be confiscated – either by settlers or the Israeli authorities. The tent was put up in the middle of the day, with unabashed impunity, on a hill across from the already established “Blue Tent”, so-called due to the settler choice of colour. The first tent appeared 6 months ago and now has developed into a caravan-tent lodging big enough for one or two families. Mohammad Khalil. Photo EAPPI/L. Hilton. The Israeli settlement outpost in Khallet Annahlah. Photo EAPPI/L. Hilton. Hassan then took us further along and we entered the farmland of Ziat Zenat – though we couldn’t make out where his farm actually was as, on 11 April, the Israeli army bulldozed all of his stone terraces that were used to grow a variety of herbs, such as sage. While speaking with Ziat, 3 Israeli settlers in a white car saw us on a hill opposite with binoculars and made a phone call. Within 10 minutes, 4 army vehicles had rushed on the scene, each full of soldiers – at least 13 in total – with the settlers following behind. The settlers and soldiers were all heavily-armed and the Commander of the soldier’s unit was seen laughing and shaking hands with the settler behind the wheel of the car. We have come to learn that it is not unusual to see soldiers and settlers fraternising together. A soldier, originating from Los Angeles who has been in Israel for 3 years, questioned us over our presence despite being with the landowner on his land, and accused Hassan of trying to do a demonstration. “A Palestinian walking on their own land is a demonstration”. Ziat stands in front of his destroyed farm. Photo EAPPI/L. Hilton. The Israeli army arrives after Israeli settlers spotted our group walking on Ziat’s land. Photo EAPPI/L. Hilton. A court case on the 24th April declared 300 dunams (3 hectares) of the area as “State Land” but this is currently under appeal so no action should have been taken by Israeli authorities to destroy Ziat’s stone terraces. The declaration of private Palestinian property as “State Land” is a former Ottoman-era policy used consistently by the Israeli authorities to claim large swathes of Area C in the West Bank if the State deems them to be “uncultivated” or without documented ownership. According to the Israeli human rights NGO, B’tselem, only 9% of the total area of the West Bank (excluding East Jerusalem) was registered as being owned prior to Israeli occupation in 1967. Nonetheless, Israel defines “State Land” as being for the benefit of the local population, which would be Palestinian. However, since 1967, the Israeli Civil Administration own figures state that Palestinians have been allocated only 0.7% (860 hectares) of “State Land” in Area C whilst the World Zionist Organisation (WZO), which develops illegal settlements, has been allocated 31% (40,000 hectares). Approximately, 21% of the total West Bank defined as “State Land” (BT’Selem 2013); land that Palestinians have little hope of being authorised to utilise. In this way, Israeli authorities reappropriate land by misusing old laws whilst disregarding international laws regarding the occupier’s responsibilities to those occupied. 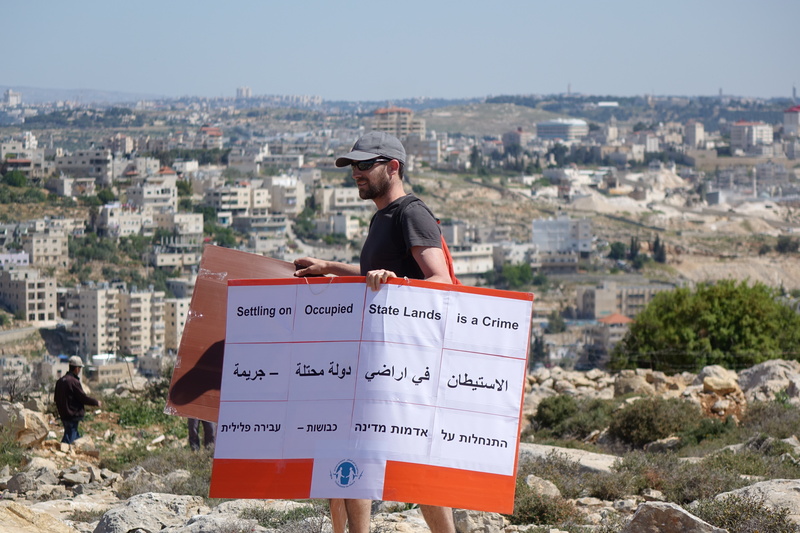 On the 18th April, recognising the strategic importance of the area, a nonviolent demonstration was led by Combatants for Peace (CfP) member Udi with Hassan and other local Palestinians from the village to make a public statement of the illegality of the settler’s actions. When organising the demonstration, the local media are always invited to ensure that as many hear about it as possible. “A demonstration which does not make the media, does not exist”. An Israeli peace activist with Combatants for Peace joins the demonstration. Photo EAPPI/C. Holtan. The Israeli peace activists parked up on the road, blocking the entry to the land, and walked quickly over to the settler tent holding two Palestinian flags. Speed was of the essence as everyone knew how quickly the soldiers would be called out by the settlers. The white settler vehicle could be seen observing the demonstration and, again, within 15 minutes; the soldier’s jeeps could be seen driving towards us in the distance. Udi and the other Israeli peace activists placed the Palestinian flags over the settler tent to “reclaim” it, and its land, as Palestinian. Udi then announced through a megaphone that the settlers are on Palestinian land and that they are even outside of the artificial border Israel has created through building the Separation Barrier. The demonstrations aim to reclaim the tent is accomplished. Photo EAPPI/L. Hilton. Udi speaks to the group on his megaphone. Photo EAPPI/L. Hilton. Observing the Israelis and Palestinians working together towards a common goal; it was possible to see that both members are equal with neither instructing the other – even if the law is not applied equally to them. Only Israelis can dare to place their cars blocking the road and risk putting a Palestinian flag over the settler tent because the soldiers only have jurisdiction over the Palestinians, who live under martial law, whilst the Israelis live under civil law which means that they fall under the authority of the Israeli police. This dual legal system over the same territory is inherently discriminatory and disenfranchises Palestinians. Once the soldiers had reached the tent by foot, everyone was ordered to leave by 11am, and having achieved the objective, the demonstrators complied and returned to the village of Khallet Annahlah. Once returned, a soldier accused Hassan of assault using a word in Hebrew which is ambiguous as to whether it was a verbal or physical assault, and the soldiers seemed incensed at being prevented from stopping the demonstration. A member of CfP said that, for soldiers, “lying to them is an assault to the respect they expect”. They detained Hassan and attempted to arrest him but after an hour of negotiation by Israelis; the soldiers let Hassan go. It was clearly due to international presence and Israeli activist intervention that Hassan evaded arrest and the demonstration was a success. Hassan is worried when he is told he will be detained. Photo EAPPI/L. Hilton. A member of Combatants for Peace negotiates for Hassan’s release. Photo EAPPI/L. Hilton. We returned to Khallet Annahlah on 29 April, the same day settlers were ordered by the Israeli High Court to remove the illegal new tent there, to see Mohammad Ayesh, 55yrs old and his son Qasm, who own the farm next door to Ziat. Settlers had come the day before and tried to take Mohammad’s sheep and goats. He told them that they couldn’t take his animals but the settlers called the army and they detained him for 2 hours. The morning we went, at 9am, the settlers brought a horse and allowed it to eat the farmer’s crops and started constructing a barracks. Israeli settlers begin new construction begins in the settlement outpost in Khallet Annahlah. Photo EAPPI/L. Hilton. “We will give you water but only if you don’t associate with them [the three farmers]”. “The settlers have taken 40 dunams, but that’s just a step on their way to take…the remaining 300 dunams [30 hectares]…We’ve decided to make non-violent and useful activities here together, to save the land”. 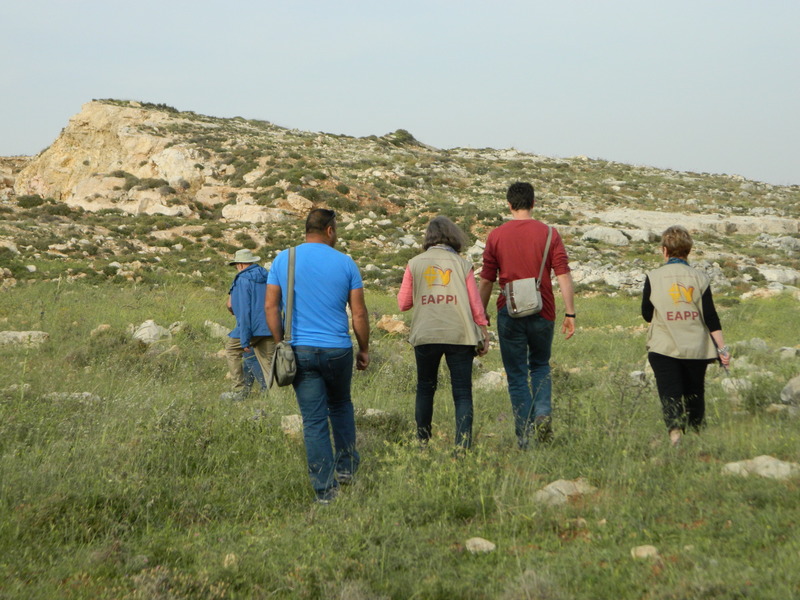 “We know you [Ecumenical Accompaniers] come here and volunteer your time, working day and night, to help and we feel it’s something that we, as Israelis, should be doing. Thank you, we appreciate you”.